On Saturday, September 1st, KlowdTV will present a battle between highly regarded cruiserweights, Thabiso Mchunu and Thomas Oosthuizen in a 12-round bout from The Emperors Palace in Kempton Park, South Africa. The fight will mark yet another world-class boxing event that KlowdTV is bringing to the fans in the United States. Mchunu of Cato Ridge, South Africa has a record of 19-4 with 12 knockouts. The 30-year-old southpaw has been a player in the cruiserweight division for the better part of the last decade. He has big wins over Sean Santana (4-1), Daniel Bruwer (21-1-1), and Zack Mwekassa (10-2); also, two wins over Flo Simba (12-2), former world heavyweight title challenger Eddie Chambers (36-3), Olanrewaju Durodola (17-1), and Boniface Kabore (18-3). He stopped Ricards Boloniks in his most recent winning bout on June 23rd. Mchune lost in his bid for the WBO Cruiserweight title on December 17, 2016, when he was stopped by Oleksandr Usyk. Oosthuizen of Booksburg, South Africa has an impressive mark of 27-1-2 with 16 knockouts. The 30-year-old Oosthuizen is a 10 year professional who has a plethora of big victories to his credit, most notably against Semanda Shabane (1-0-1), Jared Lovett (7-0) Cleber Argente Alves (5-1), Saul Roman (32-6), Evert Bravo (15-1-1), Aaron Pryor, Jr. (16-3), Francisco Sierra (24-4-1), Serge Yannick (14-1), Marcus Johnson (21-1), Rowland Bryant (16-1), Former world title challenger Fulgencio Zuniga (25-5), Ezequiel Maderna (20-1), Ryno Liebenberg (16-1), Robert Berridge (26-2-1), and Daniel Bruwer (24-6-1). Oosthuizen is coming off his 1st professional defeat when he lost by a decision to world title challenger Igor Mikhalkin on May 19, 2017, in Germany. KlowdTV is a 24/7 live streaming service that has over 32 live channels and 50 music channels. KlowdTV can be accessed on the KlowdTV Box, Apple TV, Opera TV, Smart TV’s, Amazon Fire TV, Android TV, Computer browsers, ROKU, and all IOS or Android devices. To sign up visit www.klowdtv.com and choose the premium package option. 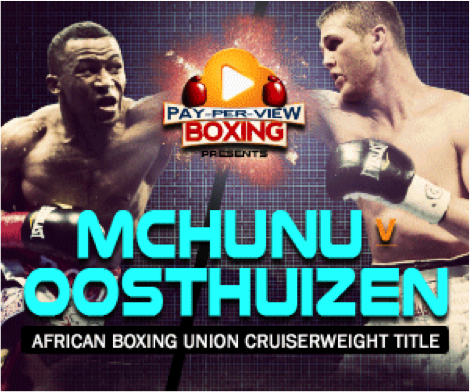 The Mchunu v. Oosthuizen bout is available on KlowdTV to United States viewers only. There will be no free trials available for live boxing events.